Honeywell vehicle-mounted computers have advanced the platform to meet the daily challenges and demanding work environments of warehouses and distribution centers. Now in our tenth generation of vehicle-mount computers, the Thor™ family reflects our extensive knowledge and level of commitment to serving the needs of supply chain operations of all sizes. Powerful, flexibility and application-expandable solutions that help future-proof your operations. Available with breakthrough innovations that deliver rapid value for your workflows. Rugged designs minimize downtime and maintenance costs in the toughest environments. Loaded with Microsoft® Windows®-based operating systems for simple integration and deployment. Available with a variety of display sizes from 16.5 cm (6.5 in) up to 30.7 cm (12.1 inches). With SMG3 and Honeywell, your enterprise will have access to ingredients for a complete customizable solutions recipe. 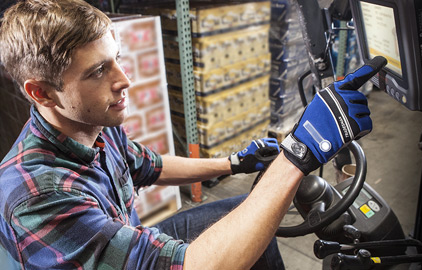 Pair the SMG3 solutions recipe with Honeywell vehicle-mounted computers with an advanced the platform to meet the daily challenges and demanding work environments of warehouses and distribution centers. Thor™ CV31 is our most compact vehicle-mount computer. It gives you the latest computing technology and support for Vocollect™ voice-directed workflows in a design that minimizes driver line-of-sight obstruction. Features a 16.5 cm (6.5 in) display for critical supply chain workflow information that’s easy to see and reach, but never in the way. The mid-size Thor™ VM1 computer provides unprecedented flexibility for your supply chain operations. It combines a 20.32 cm (8 in) display with breakthrough innovations that deliver rapid value for your workflows. Maximize every minute with the CV41 computer and its integrated Vocollect™ voice support. Reduce forklift operator downtime, gain visibility into your fleet utilization and safety, and integrate seamlessly with the industry’s broadest suite of advanced data collection solutions for your distribution center. Features a 20.32 cm (8 in) display. Honeywell designed the Thor™ VM3 computer for the toughest distribution center environments, manufacturing facilities and freight operations. In fact, it’s the industry’s most capable full-size vehicle-mounted mobile computer. The VM3 computer combines a 30.73 cm (12.1 in) display with breakthrough innovations that deliver rapid value for your workflows.